Dahlia flowers are popular landscape plants known for their wide range of colors, heights and forms. These versatile flowers are ideal for novice gardeners. Dahlias, which can grow as either annuals or perennials, are plants that produce striking colorful flowers. These easy-to-grow plants make excellent flowerbed additions as their flowers come in one of the widest range of shapes, sizes and colors of any garden flower. Dahlia flowers are all colors except for true blue and some dahlias have striped colors or tips of a different color. Besides their beauty, they’ve even been used for medical purposes such as treating diabetes, as diabetics were once given a diabetic sugar made from dahlia tubers. Few garden plants have inspired such passion as dahlias, dating back to their first introduction to Europe in the 17th Century. They are easy to grow tuberous half hardy perennials, and there are many thousand dahlia varieties in a huge range of shapes and sizes and in a wonderful variety of colors from white and yellow to deep shades of purple so dark that they are almost black. Some gardeners consider them too flamboyant for the temperate garden – others adore them; their most ardent devotees form societies, send each other newsletters and fill their gardens with ever more sumptuous blooms. Dahlias occur naturally in Mexico and South America, where the Spaniards first “discovered” them. The earliest reference to them occurred in 1615, but were then considered as an edible tuber rather than an ornamental flowering plant. At first, they didn’t attract much notice in Europe and weren’t recorded again until the late 18th century when the first tubers were sent back to Europe. The dahlia was still considered primarily an edible plant until 1815 when the first double flowered varieties were bred in Belgium and they quickly became a popular garden plant. They hybridise very easily and by the late 19th Century more than a hundred different varieties were listed. Today there are over 50,000 different dahlias in cultivation, and to try to bring a degree of order to the bewildering array of shapes, sizes and colors of dahlia flowers they are classified in ten different groups, ranging from Single and Anemone Flowered types to Pompoms, Large Decorative and Cactus flowered dahlias. At this point the classifying committee seems to have given up, and the tenth group is named simply “Miscellaneous”. They range in size from dwarf dahlia forms which wouldn’t seem out of place in the alpine garden to head-high stems bearing massive 6 – 8 inch blooms. Colors, too, range over almost the whole spectrum, excepting only green and blue, although there are lavender and mauve shades, as well as bi- and multi-colors. The Decorative and Cactus types are generally considered the most spectacular, and are the most popular with the non-specialist gardener. Dahlias are often grown grouped together in formal bedding schemes for maximum impact. However, planting dahlias in small groups in mixed plantings can be very effective, and they also look well as pot grown plants on a patio. Dahlias range in sizes from mignons that are only two to four inches long to to large flowers that are more than ten inches wide, according to Planting Flower Bulbs.com. Although giant varieties (over ten inches wide) take longer to bloom, smaller varieties are used more in bouquets and floral arrangements. Flower production may be slower when summer temperatures are high and plants are stressed for moisture. Dahlias do best in well-drained humus rich soil and full light. Although they can’t take cold temperatures, they do benefit from cooler climates with much rainfall. They bloom from mid-summer through the first frost and can look even more spectacular in cool weather. Dahlias are classified by their petal arrangements and shapes. Single-flowering dahlias have a single row of petals, while anemone dahlias have an additional ring of small petals. Orchid-flowering dahlias have ray florets that curl upward along edges and collarette dahlias have only one outer ring of ray florets that lay basically flat. Decorative dahlias have full double blooms without a disc, while ray florets are wide, mostly flat and slightly twisted. Ball dahlias are somewhat flattened and ball-shaped with full double blooms. Pompon dahlias are similar to ball dahlias, but are smaller and more globular. Cactus dahlias have full double blooms with ray florets that are typically pointed, while the semi-cactus variety has ray florets that are wider than cactus dahlias. Bacterial wilt causes wilting and stems to drop. Infected stems show a soft wet rot near the soil. Bacteriosis, which is linked with a foul odor, causes stem softening and browning. It causes the pitch to blacken and become moist with the rot going into bark. Botrytis Blight or gray mold is a fungus occurring during high humidity. Common pests are aphids, mites, slugs and deer. Aphids and slugs are the first pests to appear in a growing season, while mites emerge from mid-summer to late-summer. Other pests that sometimes attack dahlias are thrips, caterpillars, earwigs and wasps. Dahlias (Dahlia pinnata) are gorgeous additions to the summer flower garden and every flower garden design should include at least one or two varieties of dahlia, if not more. Dahlias are winter hardy to about USDA zone 8. In colder areas, dahlia tubers are customarily dug (lifted) in the fall once frost has killed back the foliage. This allows you to keep favorites from one year to the next and increase your plantings or share with friends. Or, you can purchase new ones each spring. It’s up to you! Dahlias are among the most popular and easy to grow ornamental flowering plants. Simple care and cultivation will give stunning displays of colorful flower. Dahlias have a long history as garden plants and today there are over 50,000 different dahlias in cultivation, in a huge range of shapes sizes and colors. 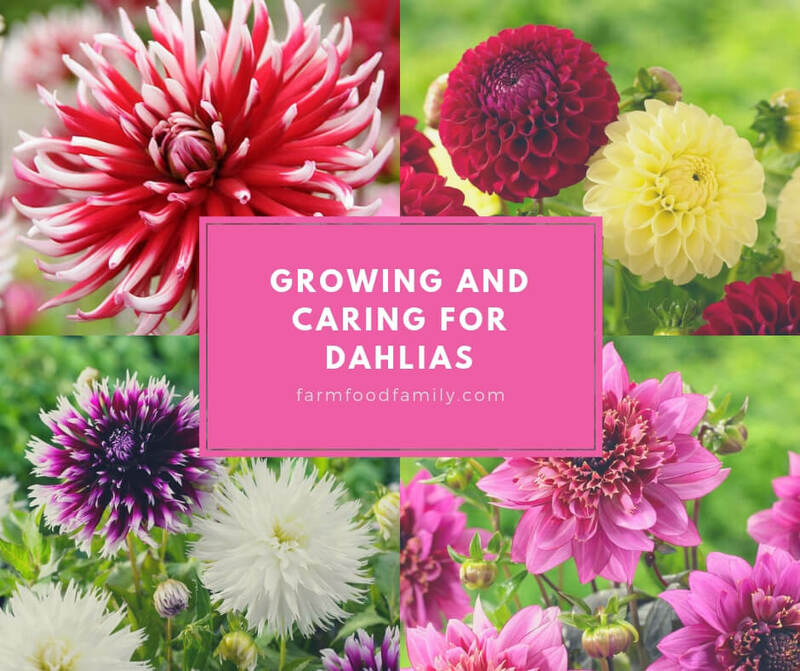 Growing dahlias is generally easy but they should be treated as half hardy perennials in most areas, and in frost prone areas it may be necessary to lift the tubers to overwinter dahlia plants. They may also need protection from pests and diseases. An exciting bonus when growing dahlias is that it´s easy to breed new dahlia varieties. Dahlias will grow in almost any situation, but give the best results in full sun and a good loam soil enriched with plenty of organic matter. Some gardeners prefer to set them out in informal groups in a mixed border, but they lend themselves to more formal plantings in beds set aside exclusively for dahlias. If growing them purely for cutting, set them in rows to allow easy access and tying in. Treat them as half hardy bedding plants in their first year, starting the dahlia tubers into growth under glass, and not planting out rooted cuttings or sprouting tubers until after the last frost. To start tubers into growth, bury them in trays of dry soil, sand or compost, with just the old stem showing in a cool, dark frost free place, like a garage or shed, or under the greenhouse bench. Bring them into full light when the first new shoots are half an inch or so long. In Britain, sow dahlia seed in greenhouses in February-March, planting out the seedlings after all risk of frost is past. Plant them out where they are to flower in May, and stake medium and tall growers immediately, as they’re very vulnerable to wind damage. For a normal garden display, they’ll then look after themselves for the rest of the season, with just the occasional dead-heading, tying in and tidying. For show-quality blooms and for cutting, feed regularly with a high potash liquid feed, such as a tomato feed, and disbud for fewer, larger flowers. As the autumn frost approach consider whether your dahlias need frost protection to overwinter. Slugs.Gardeners may have divided views about dahlias, but slugs don’t. It’s vital to protect the fresh young shoots with slug pellets or, if you don’t approve, your own patent remedy. Earwigs. Earwigs, too, love dahlias, attacking the buds and flowers. Clear away debris where they may hide, and try the traditional remedy of the upturned flowerpot on a cane. Then, each morning, dispatch any that have hidden in the pot overnight. Aphids.Aphids not only attack the fresh shoots and buds, but also expose the plants to disease. Spray early and often. Fungal Infections.Dahlias are vulnerable to rot and mildew, but also watch out for mosaic and spotted wilt, producing stunted, discolored plants. Controlling aphids, which carry the diseases, gives some protection, but there’s no cure, so lift and burn any infected plants immediately. As dahlias hybridise so readily, it’s very easy to breed new varieties, and there’s always the chance – however remote – that even a novice may produce a stunning new variety. At the most basic level, all you need to do is gather the seed from ripe, randomly fertilized flower heads. To be a bit more ambitious, choose two promising parents and use the pollen from one to fertilize the other (first removing the stamens from the pollen recipient and protecting the stigma from random fertilization with a plastic bag). This will only improve the odds very slightly, but it’s fun to experiment. Whichever the method chosen, sow the seed in early spring and see if any of the seedlings produce anything interesting. One might just be a Chelsea Show stopper! Finally, gardeners new to growing dahlia flowers can enjoy experimenting with the different varieties. If their first attempts of growing dahlias aren’t quite what they expected they can easily try another variety, especially if they grow dahlias as annuals. Because these flowers come in so many different colors, heights and forms, they offer a novice gardener many choices.